Copyright 2014 Ron Heerkens Jr, please leave watermark on and use with permission. At 6 a.m. the gun went off for runners at the Cayuga Trails 50 Mile Trail race. The athletes had been gathering for about an hour, relaxing, chatting, shaking out pre-race jitters. An hour before that though there was a gathering of folks just as dedicated to the event as the athletes and event organizers. They have planned out schedules, prepared for the moment with intensity, and they do it all without expecting to be recognized or noticed at all. There is no finisher medal for them although their day is longer than most runners. There are no race day photos taken of them. They show up in the dark, and often leave in the dark. They are the aid station volunteers of an ultra marathon event. So how do you pull off an aid station that rivals all others? Elyse Heerkens of #TrailsRoc -says it’s all about a few things. Being organized. Nothing is worse than when a runner asks for something and the volunteer wastes time looking for it. Understanding runners. You do not have to be a runner yourself, but you have to understand them and what they will need. Forget about yourself. Being willing to forget about yourself for an entire day to make sure runners have a great experience. It’s not always about the fun and support though says Liz Pfleghardt of Rochester, NY. It’s about making sure runners move on. As much help an aid station can provide, if it’s not managed properly it can really be a burden to get moving when a runner stops for too long. Other than the sense of giving back to runners, Heerkens says “I feel a sense of pride for our group and our name. Repeat runners know that they can trust us and we know what we are doing.” Heerkens among others who volunteer say it’s simple. If you want motivation to sign and up for, train, and rock your next race, work an aid station. “You feel a sense of pride from each finisher that came through your station,” says Heerkens. You want to hug them, high five them and celebrate with them. Then you want to go for a run because that’s what happens when you work the aid! 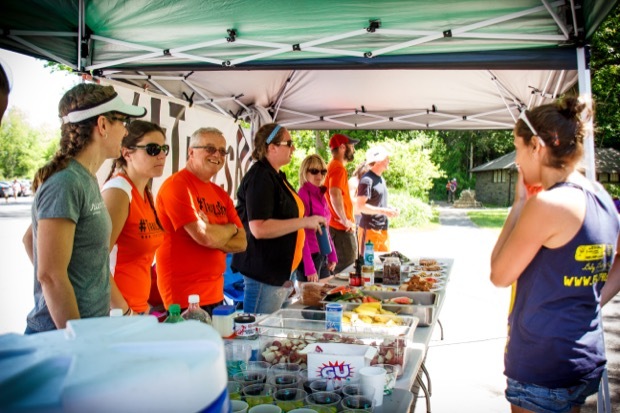 If you want to get involved at an aid station contact the Race Director of any local event. They will be sure to accept you with open arms!